You have Purchased a defibrillator for the workplace, but did you know that CPR is another essential element to saving the life of someone who has suffered a sudden cardiac arrest? Provide your emergency responders with the ability to confidently provide CPR and defibrillation to a victim with the CPR Feedback Device and Adult Defib Pads. These adult defib pads provide feedback and support for responders providing CPR in between defibrillation, guiding the responder on chest compression depth, technique and efficacy. Even a novice will be able to provide superior medical intervention and support with the Adult Defib Pads & CPR Feedback Device for the Powerheart G5. 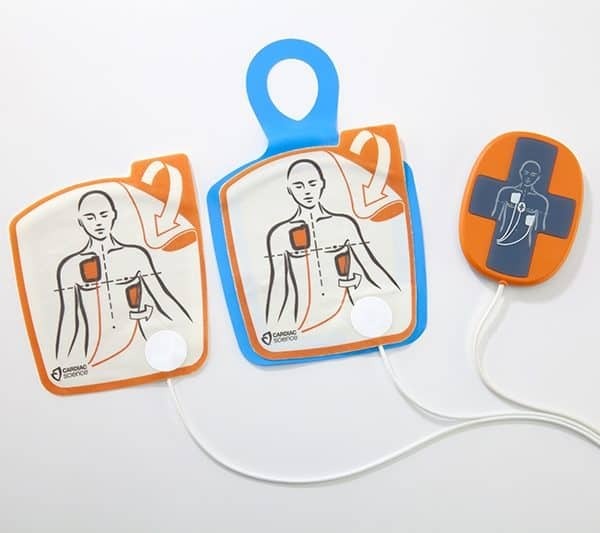 These adult defib pads with CPR feedback device are what might make the difference between a bystander intervening in a sudden cardiac arrest, or leaving the victim for treatment from medical professionals. These wasted moment or minutes can be the difference between life and death. A lot of people are apprehensive about performing CPR or using a defibrillator because they are concerned that they will harm the victim, or they do not want to catch a disease. However there are no reported cases of any person who has performed CPR catching an infectious disease, and the current research on CPR shows that the hands-only approach is sufficient to move the blood around the body and provide oxygen to the organs. With the feedback device a novice can be instructed on how perform CPR and given feedback along the way, making it an easier and relatively more comfortable experience than going in cold. Defibrillation will then be provided by the machine through the high quality adult defib pads, to allow the heart muscle to return to normal rhythm. Sudden cardiac arrest is caused by the heart muscle failing to ‘beat’. This may be caused by the heart beating too fast, too slow or irregularly, a state which is referred to as arrhythmias. All of this can be traced back to a misfiring in the heart’s electrical system, which then does not provide the correct electrical impulses to the heart. When the heart does not beat the blood cannot travel about the body and supply oxygen to the organs. This is what causes the collapse and lack of breathing in someone suffering from a sudden cardiac arrest. These are often the only symptoms, and unfortunately sudden cardiac arrests are not isolated to the elderly and sick. There are 3-4 sudden cardiac deaths each week in Australia in people in the 1-35 year age group. Unfortunately there is often no reason to suspect an attack in these individuals. Defibrillation of the heart is needed to allow the heart muscle to reset and convert back to a normal rhythm. However defibrillation will be less effective if CPR is not also performed. CPR extends the window of opportunity for treatment and its effectiveness. For example, if the heart is struggling to restart into normal rhythm, CPR will continue to push the blood through the body so it can ‘feed’ the organs. Treatment needs to be quick and is most effective when performed confidently. The Chain of Survival demonstrates the importance of speed in intervention: – Early access – Early CPR – Early defibrillation – Early advanced care As you can see, CPR precedes defibrillation. This product assists with these two elements of the chain, helping to improve the standard of the intervention provided. Many people are scared of hurting the victim when performing CPR but the feedback device will guide and reassure the responder, ensuring that their efforts are not wasted by giving feedback on the CPR performed. The adult defib pads are easily removed from their packaging and simple to place on the body, with diagrams to illustrate pad placement. Any first aid kit will be improved by the addition of this product which may one day help the user to save a life.